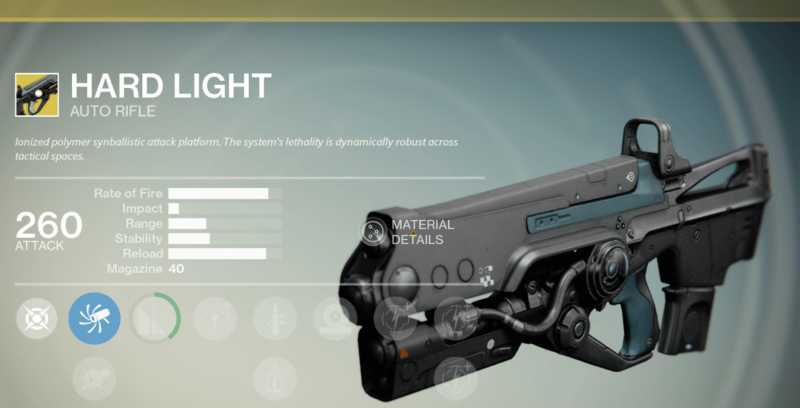 Home Destiny News Destiny Xur’s Inventory: Should You Buy Hard Light? This week Xur is selling, among other things, Hard Light. This Exotic Auto Rifle is one of the most interesting in Destiny, with a unique perk that makes it incredibly useful to those who like to hold the trigger down until the bullets are gone. Volatile Light, the exotic perk, means that rounds fired from this gun have no damage falloff, overpenetrate targets, and ricochet off hard surfaces. If your rounds have no damage falloff, then they will do as much damage to your target when they hit them from a hundred metres away, as they they would if they hit them from three feet away. This alone is deadly, as damage falloff is a big part of how enemies get away from your shots in both PVE and PVP. I would say thanks to this the weapon performs better in PVP because there is less change for enemies to avoid serious damage from you shooting at them from a distance. Overpenetrating bullets will pass through enemies and hit others behind them. In PVP this won’t come in handy too often, but you know how important this could be in PVE. This part of the perk will make Hard Light perform well in strikes and Raids. You’d be surprised how useful this is when facing hordes of smaller enemies, even just when you’re out patrolling. Finally we come to what makes this weapon so interesting, the bullets that ricochet off of surfaces. If you fire the gun at a surface then you’ll see the bullets bounce off at an angle, it’s that simple. You may not notice this at first, but you will see some bullets bouncing around as you kill foes in PVE, but taking the gun into PVP is where you’ll make the most of it. Hard Light lets you effectively shoot enemies from around corners, so if you master the angles that the bullets bounce off at, you could kill an enemy as they hide from you. I have found Hard Light to be a really useful Exotic weapon, though not as good as some of the others out there. Really it depends on what activities you participate in the most, but I will put it out there that this gun is more well-suited to PVP than it is PVE. Taking the gun into a raid might make you the enemy of your fireteam however, because it’s not as good as some of the other exotics out there. If you enjoy using the gun, then go for it, it will do a lot of damage and it will help you reach those achievements that you haven’t met just yet.